La Casita Cultural Center is hosting an opening reception for “None of That,” an exhibition by artist Juan Alberto Cruz, on Thursday, March 5. The opening reception will take place from 6-8 p.m. at La Casita, located in the Lincoln Building at 109 Otisco St., Syracuse. The event is free and open to the public. In his exhibition, Cruz reflects on his discontent, on what he describes as a futile attempt to communicate something, constantly seeking and not finding a more far-reaching meaning in his work. 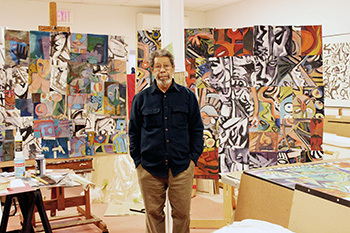 The creative process has caused the artist to re-examine his body of work from decades of painting and cut it to pieces. Cruz has been slicing many of his signature pieces, large canvases full of color in motion, and recomposing them into new pieces that combine bits from various past works into each new piece. The notion of the artist destroying his own work may seem a like a sort of violent act, but for Cruz it is more of a calculated, profoundly meditated process. Cruz was born in Cataño, Puerto Rico, in 1941. His work has been recognized and presented in museums and galleries locally and statewide, as well as in his native Puerto Rico.